Pokies with a Chinese theme are incredibly popular, not just across Asia, but worldwide, so each games developer seems to have a number of them in their collections. Ainsworth have jumped on this particular bandwagon with their Dragon Lines game that features drums, lucky coins, fireworks and, predictably, dragons across its 5 reels. 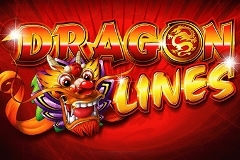 While the overall theme and choice of symbols looks like something the designers could have thought up in their sleep, Dragon Lines is actually a pretty good example of Chinese style pokies, as it comes with some interesting features, notably a free spins round with stacked wilds, plus the more common wild and scatter wins that can occur in the base game. These nice, straightforward bonuses should appeal to anyone who likes un-complicated games, and also to those who like to see lots of wins coming their way. Like many Ainsworth pokies, it’s filled with detail and has been designed with care. A deep red background offsets the gold reel surround very nicely and below the game is an easy to use set of control buttons that gives players multiple bet options. They can activate any number of lines, from just 1 to all 100, for stakes that can range from just 0.01 to 75.00, so casual players and high rollers will all be able to find their comfortable bet limits. There’s the standard playing card icons making up the lower value wins, and like all symbols, apart from the 9 and scatter, players need to land 3, 4 or 5 of the same type on adjacent reels, across an active line running left to right for a win. With 100 lines in play, that shouldn’t be a particularly difficult task, although because it’s relatively easy, the average amount won with each combination might not be much. The 9 differs because it will only need to land on reels 1 and 2 to be worth a prize of 2x the line bet, while 3, 4 or 5 of them will pay out 5x, 10x or 100x. The most valuable playing card symbols are the K and A, which will be worth 5x the line bet when 3 land, while getting 4 in a row will pay out 50x and a full line of 5 will see a prize of 100x returned to the player. Pictures related to the Chinese theme will be worth more and anyone who has played a pokie of this type will recognise the firecrackers, drums, paper lanterns, gold coins and some sort of golden bowl that seems very popular across these games. The most valuable symbol is the bowl and when it stops across the reels, players win 50x, 100x or an impressive 1,000x their line bet. The dragon makes a welcome appearance as a wild symbol and although it will only land on the middle 3 reels, it will act as all except the scatter if it’s possible to create winning combination where there wouldn’t have been one without it, or to extend a winning line of 3 matching symbols into a higher-value line of 4. The scatter is an elaborate yin-yang symbol and this is worth 2x, 10x or 100x the total bet per spin when it appears in any 3, 4 or 5 places. It will then start a free spins game and although there’s just 10 of them to start with, any time 3 or more scatters appear during the round, an extra 5 spins will be added. During the free games, any time the wild dragon appears, it will be stacked across the whole reel, which should make it easier to complete a winning line or maybe several at once, especially if it turns up on more than a single reel at a time. Dragon Lines may not be the most original, or feature-filled pokie ever released, but the combination of a very popular theme and easy gameplay should make it a success nonetheless. There’s no great surprises in the design and layout of this game, with the playing card symbols being the same ones featured across most Ainsworth titles and the picture symbols also being pretty common, but maybe this shouldn’t be seen as a bad thing, as many people like familiar-looking games and this one is just catering to that audience. Having 100 paylines is a nice touch though, as this makes it very easy to land winning combinations and as most players would rather see frequent, lower value wins than have to wait for ages for a bigger win to come along, Dragon Lines could be just the game to give them what they want.